Mesopotamia means “the land between the rivers,” referring to the region near the Tigris and Euphrates, but over time, it has been accepted as referencing the civilizations that lived and gave into death there. Ancient Mesopotamia has fascinated poets and writers for centuries. Prior to 1840, when the first excavations began, knowledge of ancient Mesopotamia was based on only three sources: the Bible, Greek and Roman authors and the Greek writings of Berosus. Mesopotamia means “the land between the rivers,” referring to the region near the Tigris and Euphrates, but over time, it has been accepted as referencing the civilizations that lived and gave into death there. The irregular and often violent flooding of these two rivers made development challenging for those who settled there. The floods added rich silt to the soil each year, but protecting young plants from surging flood waters and successfully irrigating the land throughout the year required highly organized human labor. Mesopotamian civilization can be traced back to a group called the Sumerians living in the southern region as far back as 3100 BCE. The Sumerians developed cuneiform writing that was a system of using a stylus to make wedge-shaped marks on wet clay tablets that were later dried and stored. This system became the dominant style of writing in Mesopotamia for more than 2000 years . 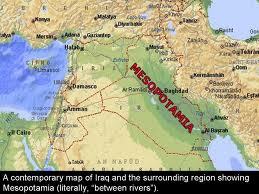 Ancient Mesopotamia had many languages and cultures, but no permanent capital city or geographic unity. Through persistent archeological excavation, historians have been able to create a vivid portrait of the life and development of Mesopotamian civilization through the years. Because of their early and continued persistence at written documentation, there is a record of highly developed bureaucracy among Mesopotamians. Although gaps exist due to insufficient acquaintance with vocabulary and difficulties with the grammar, much can be learned about the Mesopotamians’ adaptation to geographical and environmental concerns . For instance, the technique of building with mud brick was necessitated by the shortage of fuel in the area. This resulted in buildings that were very vulnerable to weather and in constant need of repair. As might be expected, many settlements were located along canals and rivers, making travel and access easier than for those located in the heart of the desert. Hassuna and Tall Sawwan are two early villages discovered in the plain of Mesopotamia. Hassuna produced advanced pottery and the six-row barley crop that would later become the chief grain crop of southern Mesopotamia. Tall Sawwan, located south of the boundary of rainfall agriculture, must have developed some form of artificial irrigation in order to survive. Paper Masters writes custom research papers on Mesopotamia and delves into the history of this ancient civilization.